Off the southeast coast of the Alaskan peninsula lies the second largest island in the United States. Measuring some one hundred forty five miles in length and sixty miles wide, Kodiak Island is a sportsman’s paradise and home to the majestic brown bear, the massive carnivore that made this island famous. It is here on this pristine island where the legendary bears still thrive in a forage rich environment, feeding and reaching massive proportions. A mature male Kodiak brown bear can attain an overall standing height in excess of eleven feet with ten-foot bears being quite common. This Kodiak bear hunt begins with a scenic float plane charter from the Kodiak airport to a modern lodge situated in a secluded bay some thirty air miles to the south. Depending on hunting conditions and bear sightings, either the lodge or a remote spike camp will be home for this ten-day Alaska bear hunt. Both spring and fall bear hunts are available with hunting methods being very similar although spring hunts can demand much more physical exertion. Fall Kodiak brown bear hunting calls for glassing at much lower elevations as the big bears scour the salmon streams and estuaries for food in preparation for hibernation. Your host for this brown bear hunt is a registered master guide who has lived on and hunted Kodiak Island for nearly thirty years. His knowledge of the hunt area, terrain and habits of these big bears will afford you the hunting experience of a lifetime. Spring seasons run from mid-April through mid-May with the fall hunt being much shorter from late-October to early-November. 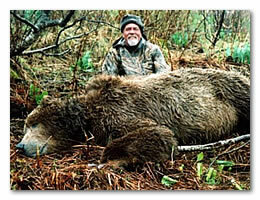 Brown bear tags for Kodiak Island are issued only through competitive drawings. Although draw success is generally good, it is not guaranteed. The license application deadline for our 2018 spring brown bear hunt is December 15th. For more information, contact us via e-mail or call us at 1-800-487-0045.